Do Mastermind Group Members Need to be in the Hot Seat Every Time? « Mastermind Group Action Plans: Get Your Members Moving! People always ask me: Is it a true mastermind group if people don’t get to be in the Hot Seat at every meeting? I believe the key indicator of a “true mastermind group” is that each person gets to be in the Hot Seat at every meeting (or every other meeting) and the entire group masterminds/brainstorms with that person. 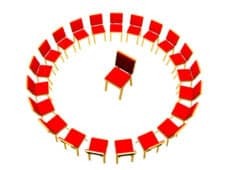 In some groups, especially very large ones, it’s more like a group coaching program than a mastermind group: one person is in the Hot Seat, the mentor/coach does laser coaching with that person, and all the other people sit silently and observe. In a true mastermind group, everyone gets involved in the conversation. That’s the power of peer brainstorming! The strongest value a member gets out of being in a group is the chance to be in the Hot Seat. When the member gets to pose his problem or question, it forces him to gain clarity about what help he’s really asking for. Then, having a small group of people brainstorm around that problem/question brings huge amount of creativity to the process. The person in the Hot Seat walks away with many more ideas and solutions than he could generate on his own. That’s why people come to mastermind groups. It’s true: there’s lots of value that members get from listening to all the ideas and solutions generated for others. I often watch a table full of group members furiously taking notes during someone else’s Hot Seat. But those ideas are tangental to their own personal situation. Listening to someone else’s Hot Seat is like standing under an apple tree and hoping an apple will fall just when you want one. Being in the Hot Seat is like climbing a ladder and plucking an apple — just the right apple — when it’s the perfect time to eat an apple. One solution is to reduce the time for each Hot Seat. I’ve seen people get a lot of value out of 10 minute Hot Seats. The trick is for the person in the Hot Seat to take one a minute or two to describe his situation. Otherwise, too much time is taken talking about the challenge or need, and not enough time is spent brainstorming ideas. It’s not masterminding if there’s no peer brainstorming in every meeting. Otherwise it’s really group coaching, or a combo of group coaching plus training, that’s being called a mastermind group. Great post Karyn. We’ve been struggling with this issue and trying new formats for our group. I think this may have sparked a new idea. Thanks! this was a great article. I never really understood the difference between a group coaching program and a mastermind group. I also now understand the value of a mastermind group. Thank you for writing that it helped. Thank you so much I will be listening to your recording this weekend! Very well explained.. thanks for sharing it. I’ve found a good deal of value listening to others talking about their challenges. I might be one of the people taking notes in the background! Karyn, this is one of my favorite articles you have written. Currently, I facilitate coaching groups and accountability is a huge part of the success for individual members. I have had a desire to facilitate a master mind group and your tips in this article have helped my move my commitment level to offering a master mind group next year. You may have already written about this – but what is the ideal number for a group and in your opinion how often should a group meet for maximum benefit? I agree that it’s not a Mastermind without a Hot Seat for all with the entire group collaborating. There are far too many groups claiming to be Mastermind Groups that only serve to dilute the Mastermind “brand” and confuse the little public awareness that exists today for Mastermind Groups. It is confusing, isn’t it, J.R.? Thanks, Benay, I’m happy to help you and to spread the word about the value of mastermind groups!